How often have Samsung lovers let out this heartfelt groan when the Korean company once again packed its cutting edge technology into a lowly plastic case. 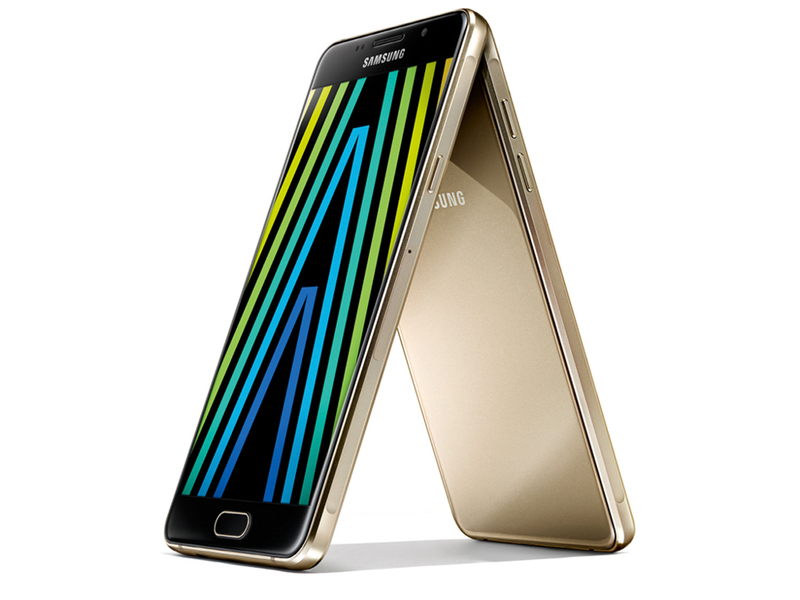 About a year ago, the first-generation Samsung A-series finally delighted style-conscious users with a metal unibody. Now, the A-series is going in the next round with the 2016 versions. First, let's take a look at the Galaxy A5 (2016). The most striking change is on the outside. Samsung has omitted the fine metal casing of its predecessor, and instead put scratch-resistant Gorilla Glass 4 on the front and back, framed by an elegant aluminium strip. This does not look less classy than its predecessor; the combination is reminiscent of Galaxy S6 and can pass as an affordable version of the flagship. The tester found the original case a tad better but, as we all know, tastes differ. The same holds true for colour preferences, and Samsung therefore offers its new Galaxy-A models in black, white, gold, and rosé gold. There is a choice for each individual taste. But Samsung not only trumps with the look and feel of its mid-size device, the Galaxy A5 (2016) also scores with its screen. The 5.2-inch OLED display has a full HD 1080 x 1920 pixel resolution and a fine pixel density of 424 ppi. This fits also the enormous brilliance of 460 cd/m2, which is excellent for a self-luminous OLED display. With such specs, viewing display contents in direct sunlight should not be a problem at all. Users can adjust the appearance of the display in the settings menu via four different modes and for example adjust the colour intensity to their own taste. We opted for the "Adaptive Display" mode, which automatically adjusts the range of colour, saturation, and sharpness depending on screen content. The content was thus perfectly displayed in rich colours and deep black. 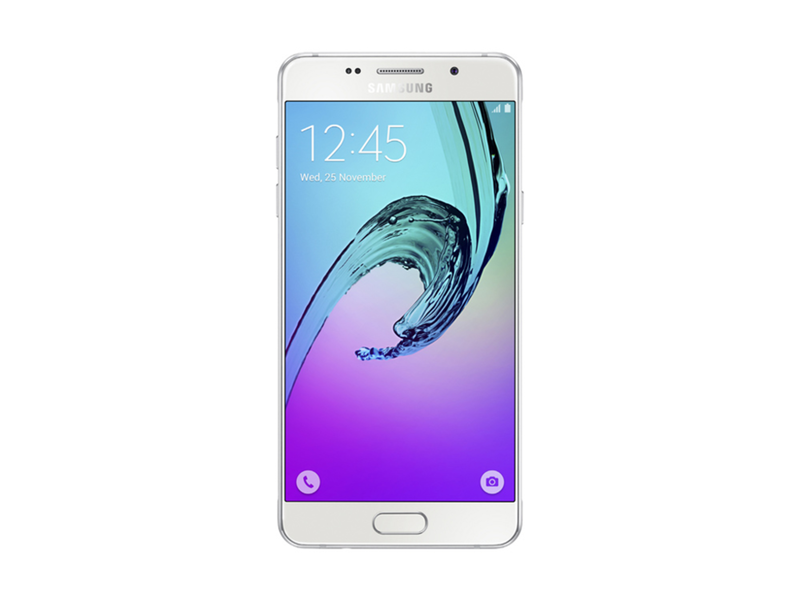 A look at the list of Galaxy A5 (2016) features also leaves nothing to be desired. The in-house platform Exynos 7580 with 1.6 GHz octa-core processor and 2 GB of RAM ensures snappy performance in everyday life. During the test phase, all content ran without a hitch and all apps opened without delay. 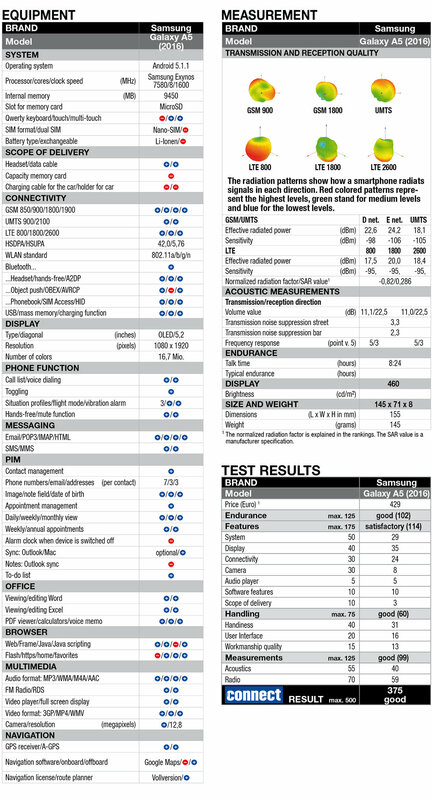 Mobile data transfer is done by LTE Cat.6 and HSPA+ and other connectivity standards such as Wi-Fi, Bluetooth, NFC, and a/b/g/n are also on board. The only thing lacking is ac support for Wi-Fi, but that is really looking hard to find fault. 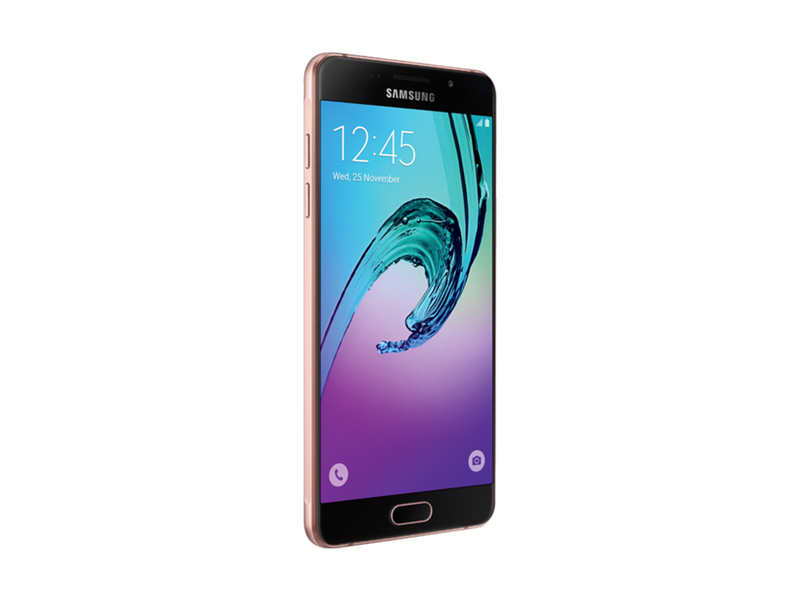 The Galaxy A5 (2016) therefore easily meets all basic equipment standards, but the Korean company also shows no weaknesses when it comes to the extras. For example, the 13-megapixel camera not only boasts auto focus and photo light, but is equipped with an optical image stabiliser for shaky shots. Added to this is a clear interface with various camera modes and a quick launch feature that is activated by double-clicking the home button. The picture quality is well above average in every situation. The camera feature is rounded off by a 5-megapixel front camera, and Samsung of course captures videos in full HD. While Samsung was often chided in the past for its overloaded user interface, this is no longer true today: The interface of the Galaxy A5 (2016) is uncluttered and intuitive to use. Samsung nevertheless offers its users a wide range of customisation options. Not only can apps, widgets, and shortcuts be added to the start screen according to needs, the design can also be customised and even the main menu can be changed. All of this is however optional, not a requirement. Those who favour a minimalistic look can use the "Easy Mode" function with extra large icons and even more simplified operation. Up to here, the Galaxy A5 (2016) is marching straight to the top of the smartphone league with its excellent workmanship, magnificent display, and extensive features. Its advance to the summit can only be stooped now by a blunder in the laboratory. But Samsung is not doing its competitors this favour, on the contrary: it also trumps with excellent values in the tests. Acoustics and reception are excellent, the battery life with 8:24 hours in display mode and a slightly longer talk time in UMTS mode are also very good. If the battery is empty, the quick charge feature ensures that the user is quickly back on air again.